Every five years Morgan received a special present. On his fifth birthday Ansél Sandberg painted his portrait. On his tenth birthday it was a bronze sculpture, for which Morgan himself modeled. Unfortunately, this sculpture was stolen already before the opening of the Cat Cabinet. 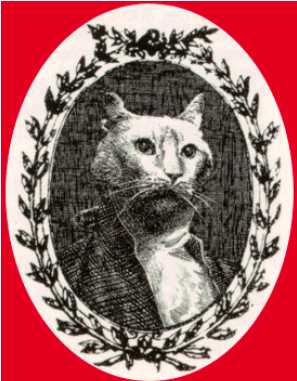 For the celebrations of his fifteenth birthday his friends and admirers compiled a book of fifty limericks, all dedicated to Morgan: "A Cocky Cat from Toulouse and Other Cat Nonsense". For that same birthday, Aart Clerkx made a portrait of Morgan so that he could easily replace George Washington on the American dollar bill. A set of these dollar bills was printed from the bank of Pierpont Morgan for the occasion. The text "In God We Trust" was specially replaced for Morgan with the text "We Trust No Dog". A few of these gifts can be seen in J.P. Morgan's own sanctuary in the museum.